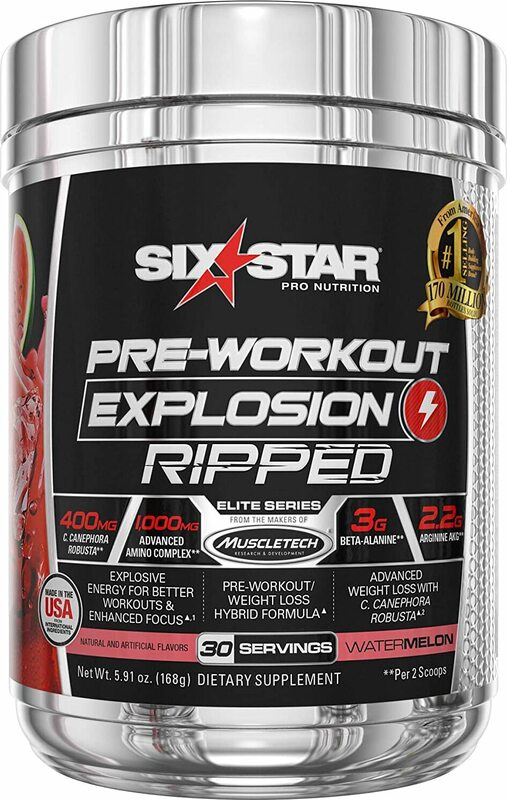 Six Star Pre-Workout Explosion Ripped is from the makers of MuscleTech, America's #1 Selling Body Building Supplement Brand, so you know it's a powerful formula you can trust. Whether it's your time at the gym or you're a seasoned vet, pro athlete or just trying to gain the extra edge in your sport, everyone is an athlete, and every athlete needs to fuel their body with the best sports nutrition products available. This cutting-edge hybrid formula includes advanced pre-workout ingredients beta-alanine, taurine, choline bitartrate and arginine AKG. Plus, it delivers C. canephora robusta for weight loss. 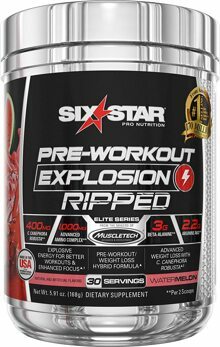 Six Star Pre-Workout Explosion Ripped is the fuel you want and is Engineered for All Athletes. Delivering sought-after pre-workout ingredients and the most studied form of creatine for increased strength and performance Six Star Pre Workout Explosion is the fuel you want before your workout for extreme energy, focus and intensity, and is Engineered for All Athletes. ²Average weight loss with key ingredient (200 mg of C. canephora robusta bean extract standardized to 45% chlorogenic acids) was 10.95 lbs. in a 60-day study with a low-calorie diet, and 3.7 lbs. in a separate 8-week study with a calorie-reduced diet and moderate exercise. ‡MuscleTech is America's #1 Selling Body Building Supplement Brand based on cumulative wholesale dollar sales 2001 to present.